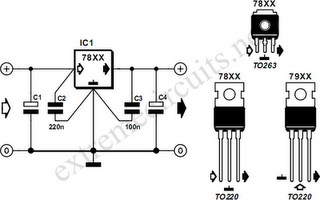 The voltage regulators from the 78xx-series are found in many analogue power supplies. It seems, then, somewhat superﬂuous to say much more about them. But on the other hand, it can be very useful to highlight the important points, just because they are so ubiquitous. The 78xx is almost always used ‘bare’, because additional components are almost unnecessary. In fact, only one additional component is required, and that is capacitor C2. Based on the manufacturer’s recommendation, this capacitor should be 220nF in order to prevent oscillatory behavior. In practice, you will almost always see that a 100nF capacitor used here. This is a value that does not cause problems. C1 is the smoothing (reservoir) capacitor, its purpose is to reduce the ripple of the rectified AC voltage and is not actually related to voltage regulation. If the DC voltage is provided by a mains adapter, then this electrolytic capacitor is usually already part of the adapter, although the value is rather small sometimes. C2 may only be omitted if C1 is close to the 78xx and C1 is of good quality (low ESR). But there is nothing wrong by playing it safe and always ﬁtting C2. Rule of thumb: always place a 100 nF capacitor on the input as close to the regulator as is practicable. Strictly speaking, there is no need for a capacitor on the output. However, a capacitor of at least 100 nF (C3) ensures much-improved regulation with fast (several microseconds) changes in load current. In practice, a decoupling-capacitor is placed close to the power supply pins of many ICs. These can provide the same function, provided they are placed not too far away. An electrolytic capacitor (C4) can be added for similar reasons: to catch slow (and fast, if it is a good capacitor) variations in load current. There is actually no compelling reason to deal with slow variations, because the IC is fast enough of regulating these on its own. Rule of thumb: always place an output capacitor of at least 100 nF preferably as close as possible to the IC with the greatest current consumption (read: greatest changes in current consumption). When building the circuit, it is important to connect the capacitors via the shortest possible path. So don’t use long wires or make large loops. Obtain the input voltage for the regulator directly from the connections of the smoothing capacitor, because the ripple is smallest there. Finally, a few remarks about the temperature that a 78xx may run at. As a ﬁrst approximation, if seem to burn your ﬁngers when touching the regulator, the temperature of the regulator is above 60°C and a (small) heatsink is definitely recommended. It is not really a problem when the IC gets too hot, because it was designed in such a way that it will turn itself off when the temperature is too high. It doesn’t actually turn off, but the output current reduces when the temperature increases. When the internal temperature has reached 150°C, the output current will be only a little more than half the current delivered at 25°C. That is why it is possible that the output voltage of the regulator has dropped even though the output current is less than the rated current for the IC. A heatsink is the obvious solution. Rule of thumb: you should be able to touch the regulator (or the heatsink) without burning yourself. If not, then the heatsink has to be larger.